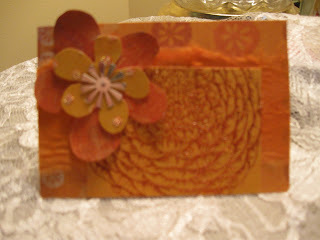 If you have not tried making an ATC yet aka "Artist Trading Card"...You should!! They are little miniature works of art that you can whip up in no time flat. in the regulation size of 2 1/2 x 3 1/2" in. you will trade with someone else! Try it and I know you will LOVE it!!! orange themed ATC!!! Don't you agree?? theme will be Leaves.....come on you will have FUN!! Love and Happy Hugs to ALL!! !